John and I don't really do Valentines Day. Our New Years Eve plans usually involve Pizza, beer and watching movies we haven't seen in a while. Christmas while awesome we give weird gifts like umbrellas and Terry Pratchett themed board games. But there is one occasion we celebrate with passion and reckless abandon. 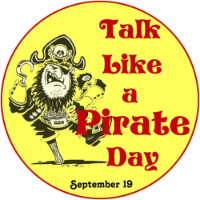 Please head over to http://www.talklikeapirate.com/piratehome.html for all your pirate talkin' needs! I may or may not have sent John an email this morning that contained the following sentence, "Yarr and avast, shiver me timbers etc." In return he sent me a link to a webcomic about a pirate. I like him.